Advanced LED Lights’ Diamond Series 200 has been market tested for a while now and is still one of the most popular choices for indoor growers. It has a no-nonsense design and comes complete with everything you need to set it up in minutes. On just 185W of power consumption, it replaces a 400W HPS, HID or MH system without the need for extra cooling measures. Spectrum – Concentration on the red and blue PAR bands that are the most important wavelengths for optimum photosynthesis. Spectrum skew to blue or red spectrum ends is switch controlled. The LED lenses work well, but create more light spread than collimated reflectors found on other lights. Spectrum switches are less versatile than dial controls found on other models. Bridgelux LEDs are high-quality lamps with a lifespan of 50,000 hours or more. Advanced LED Lights’ legendary LED drivers, oversize heat sinks, and superb cooling make sure the DS 200’s LEDs produce full output that lasts for years without luminosity degradation. If you have investigated other Advanced LED Lights’ products then the spectrum graph to your right might look familiar. Unlike older technology lighting products or lower quality LED grow lights, the DS 200 optimizes its spectrum output in the blue and deep red bands. At any time, you can modify the spectrum mix and intensity to move your plants from the vegetation to the flowering stage and back again. The Diamond Series 200 uses a combination of LEDs to produce over 11 bands of light in the most effective wavelengths: 760nm, 740nm, 720nm, 660nm, 630nm, 615nm-480nm, 460nm, 440nm, 415nm and 380nm. No other manufacturer offers so many individual wavelengths. These wavelengths and their intensity align almost exactly with a graph of average plant photosynthetic response, which is what makes the DS 200 such an effective grow light. Nearly all of the light produced by the DS 200 is being utilized directly by your vegetables or herbs. At a height of three feet, the DS 200 puts out an impressive 14.71 PAR/watt. This is more than triple the PAR/watt of a metal halide light or double that of HPS lights. Of course, you also do without excessive heat and the management thereof. Growing results are what matter most, of course, and in this regard the DS 200 has not disappointed its users. 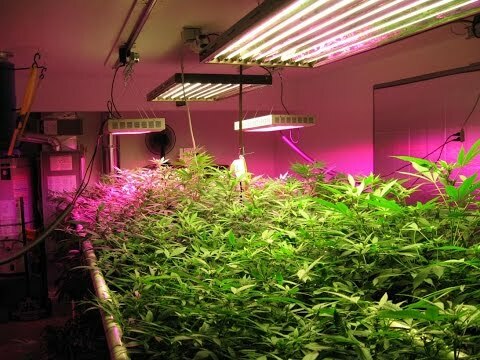 Many put this grow light alongside beds with older HPS or HID systems and soon discarded the less efficient lamps after they saw equal or greater plant growth with the LED technology. In cases where buyers received a damaged product or had operational problems, they are almost knocked over by how responsive and helpful Advanced LED Lights are with their customer support. Advanced LED Lights take their 3-year warranty seriously and turnaround time for replacement or repair is minimal. First-time and experienced buyers report a pleasant out-of-box experience when they see the professional build quality of the Diamond Series. Even if they have used HPS or HID lights before, their next observation is usually to note the intense light output from the DS 200’s 100 3W LEDs. One reviewer measured more than 1000 µmol photons m-2 s-1 of PAR at 18 inches. Though the Advanced LED Lights Diamond Series includes much larger lights, the DS 200 is popular among small-time growers or those that want to evaluate the product before committing to more or larger units. It may not have the additional features of other Advanced LED Lights products or the LED grow lights of competitors, but from a functional viewpoint it gets the job done for any indoor growing situation in a straightforward manner. It makes both an excellent entry-level LED grow light as well as one that will give good service for many years in commercial operations.